On October 20 at approximately 10:30 p.m., a Calcasieu Parish Sheriff’s Office deputy responded to a report of a single vehicle accident in the 3100 block of Smith Ferry Road in Westlake. Upon arrival the deputy discovered the truck appeared to have run off the road; striking a mailbox, tree, and fence. When the deputy made contact with the driver, Logan M. Lejeune, 29, 2508 Wilda Street, Westlake, he smelled a strong odor of alcohol emitting from his breath. The deputy also observed Lejeune to have slurred speech, glossy eyes, and unsteady balance. Lejeune advised the deputy he had drank approximately 12 beers prior to driving. 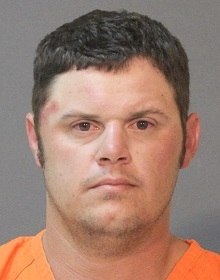 Lejeune, who was arrested for DWI 3rd in 2013, refused to perform standard field sobriety testing and was then arrested and transferred to the Calcasieu Parish Sheriff’s Office, where a breath intoxilyzer test revealed he was over the legal limit. He was booked into the Calcasieu Correctional Center and charged with DWI 4th; and careless operation of a vehicle. Judge David Ritchie set his bond at $27,500 with special conditions being he cannot operate a vehicle without ignition interlock device and a valid driver’s license, he may not consume any alcoholic beverages, and he cannot commit any other crimes. CPSO Deputy Cpl. Travis Killmer is the arresting deputy on this case.